Part 2 of our gallery features a lot of star wars, a lot of super heroes, some anime, but most importantly, WESTERN THEMED MARVEL! 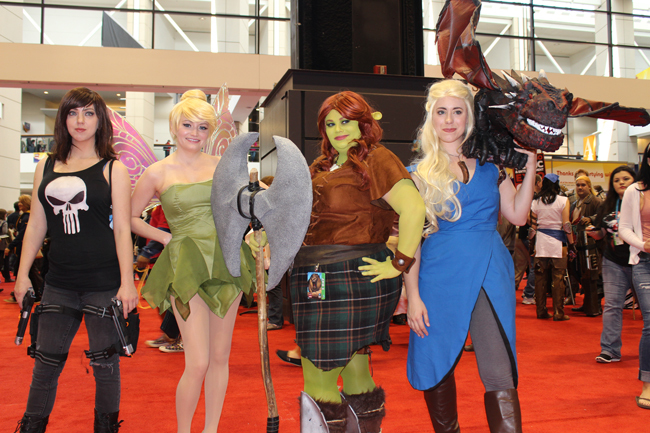 Welcome back, O Readers, to our chronicle of the often mind-blowing cosplay seen over the weekend at the 5th annual Chicago Comic & Entertainment Expo, AKA C2E2, held this weekend in Chicago. As with our first installment, there is some next level stuff happening here. I don't want to spoil it, but OK, I'll spoil it: there are Old West versions of SHIELD agents contained herein. Anyway, we'll begin with the world's craziest crossover event. Here's April Gloria as Rule #63 Punisher, Pretty Lush as Tinkerbell, Amanda Dawn as Daenerys, and Sweets4aSweet as Princess Fiona. All photos taken for The Escapist by Garret R. Brown.